If there's one thing that makes our training different from other systems, it's that we spent years just thinking about how to explain the basic function of the handgun and how your body physiologically relates to this tool. One of those areas where we truly stand out from the rest is our focus on the grip. The baseline of defensive shooting is what we call the Shooting Fundamentals. These five core elements are required to operate your defensive handgun safely and effectively. You'll want to work on these five elements from the first day you pick up a handgun to train, to the last day you put a handgun down. There is arguably nothing more important to develop in using a handgun as a Citizen Defender than your Shooting Fundamentals. How you practice these core elements will determine how high your firearm skills can rise and for this Training Newsletter, I'd like to talk about just one of these elements. Your grip is how your hands come into contact with the firearm itself. The grip can make all the difference in how much felt recoil you experience, and how quickly you can get rounds on target. Grip is based on two parts: the Primary hand and the Support hand. The Primary hand has several ways it can provide success or lead to failure. The first is the Vice grip. By a vice, I want you to think of a bench vice, that simple metal machine that rests on workbenches around the world. By gripping like a vice, to the front and back strap of the handgrip, you focus your energy where the handgun will move during recoil. This vice position also forces your trigger finger to move in a linear fashion. This means that you won't torque the handgun in the trigger press, and are more likely to get rounds accurately on target. The Primary hand also needs to stay looser than you'd think. If you grip aggressively, your trigger finger is unable to articulate quickly. That loss of dexterity increases your split times, making fast shots difficult. On the left, you have Crushing. On the right, a Vice Grip. 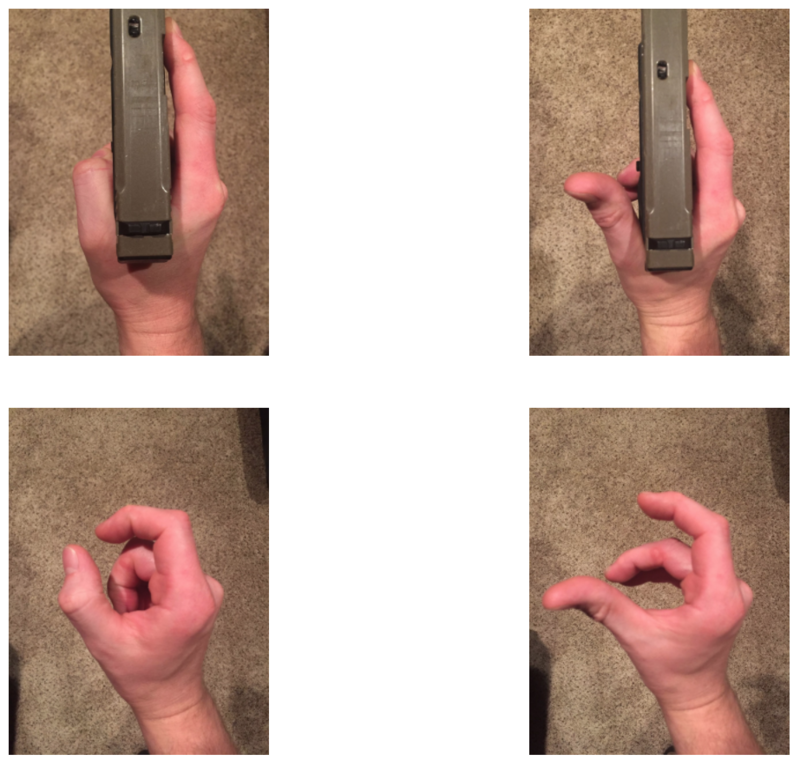 With the bottom left image, you can clearly see how the index or trigger finger is curled. That means as the hand presses the trigger, it will do so while torquing the firearm to the left. While the hand on the bottom right, doing a vice grip, will only allow the trigger finger to move in a linear fashion. That means no torquing and a straight shot. The Support hand is also critical in managing the recoil of the firearm effectively. Take a look at these two pictures. In the picture on the left, Alan's Support hand is engaging high on the handgrip of the pistol and his Primary arm is locked out. In this position, he is experiencing all of that felt recoil down the Primary arm to the shoulder, and he fails to prevent the upward rotation of the firearm in the shot. This slows him down and broadens his shot groups. The picture on the right shows Alan with a correct Support hand position. Note how much FURTHER he is rotated. That rotation forces Alan to engage at the base of the handgrip, giving him the most leverage on the handgun possible. It also allows him to have both arms slightly bent, setting up a dynamic tension spring (like the shock on a car), decreasing the felt recoil and tightening his shot groups, especially during faster split times. By fixing just these two elements - the Primary hand and the Support hand - you'll see a rapid improvement in accuracy and split times. But more importantly, you have a decreased experience of recoil. That will give you the ability to train more while not getting "beat up" by the handgun, and get more results from your training in every round.